Amazing tasting smoked sausage ring. 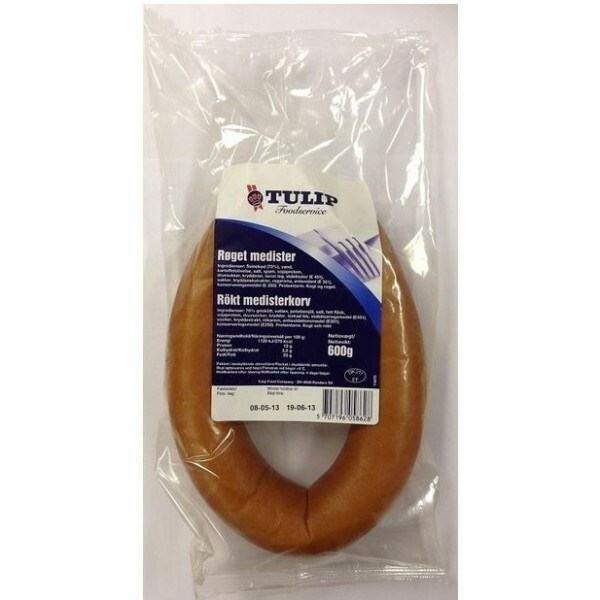 Medisterpølse is a Scandinavian speciality food consisting of a thick, spicy sausage made of minced pork .The spices generally used are allspice, cloves, salt and pepper. They are great on their own as a main course, and the leftovers make excellent smørrebrød when sliced up and placed on top of buttered Danish rye bread. While there are a number of pickled condiments that compliment medisterpølse, we like the fresh and tangy taste of Danish sliced pickled cucmber (agurkesalat). And to wash it down? Cold beer. "Skål!" Pork (70% ), water, potato starch, salt, lard, soy protein, grape sugar, spices, dried onions, stabilizer (E451), sugar, spice extracts, flavouring, antioxidant (E301), preservative (E250).